This Vegetable Soup recipe is great for you if you live outside Nigeria and can’t buy the traditional vegetables for preparing Nigerian Vegetable Soup, Edikang Ikong. I promise to upload an authentic recipe for Edikang Ikong using the traditional vegetables and when I do, I will put a link to that on this page. The following are the quantities of ingredients I used to prepare 2 medium tubs of Vegetable Soup. You will need a pressure cooker to reduce the cooking time by a lot because all these meats mentioned above take a long time to cook, up to 2 hours for the stock fish and cow skin. My Pressure cooker, the one I used in the video below is Fagor, they no longer make this model. Please read the instructions on your pressure cooker and follow it. Pressure cookers are safe when you follow the instructions. Click here to watch me tell you all about my pressure pot including tips about using pressure cookers to cook Nigerian food. The spinach acts as an alternative for Ugu. The lamb’s lettuce is a close alternative to water leaves. You can reduce the quantity of palm oil but spinach has a very strong taste so you need enough palm oil to mask that taste. Watch the video below for more tips on preparing and enjoying this vegetable soup. It contains lots of spinach so if you do not prepare it well, it will taste so bland, you will regret preparing it. Bring out the frozen spinach the evening before and keep it on your kitchen counter to defrost on its own. It is not advisable to use a microwave oven to defrost the frozen spinach. Cut the cowskin into medium pieces. For best results, use fresh red meat (the ponmo and the shaki can come from your freezer). I buy the red meat the day I will prepare this soup. 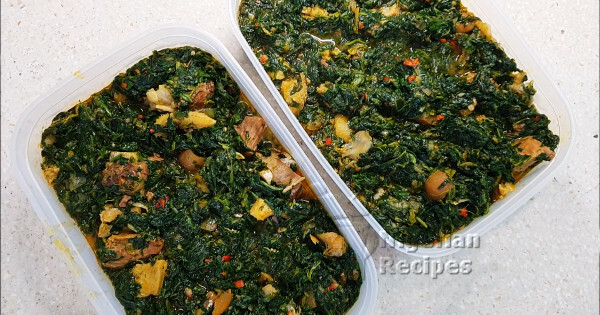 When the spinach defrosts, chop into into smaller pieces as shown in the video below. Press out the excess water that frozen spinach usually contains. Cut off the roots of the lamb’s lettuce and slice. It is best to watch the detailed video below because I tell you, a written recipe does not do the procedure for preparing this Vegetable soup enough justice. Cook the meats and stock fish with the seasoning cubes and half of the chopped onions. When done, remove all the meat and fish and set aside. De-bone and separate the stockfish into small pieces. Make sure the stock is as little as possible, if not, boil it down first before continuing. Set the stock on the stove, add palm oil, crayfish, the remaining chopped onions. Cover and cok for about 7 minutes to allow the palm oil integrate into the soup. Add the peppers, the lambs lettuce, the meats and fish. Cover and once it boils again, add the spinach. Cover and once it boils again, stir very well and add salt if necessary. Transfer the soup to cool containers immediately so the vegetables do not change colour. That’s it! Serve with any Nigerian fufu meal. Watch the video below to see me prepare this delicious soup from start to finish.